A century old design, the TL-29 has been a favourite in the US military throughout its life and is still an iconic working mans tool. This robust little thing is love at first sight! TL stands for "Tool for Linemen", these were issued to electricians and others who had to fiddle around with cables and such in the service, and many men kept theirs after they had done their part. These have been manufactured by loads of different companies over the decades, with the design undergoing only minor changes, which says something. The TL has two blades, a standard one as found on any folding knife and one with a sharpened, flat tip which doubles up as a screwdriver. 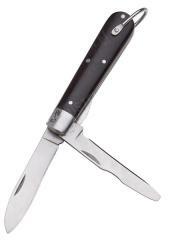 This latter one features a liner lock, a simple design which secures the blade firmly in the open position. New production, made by Mil-Tec. Pari 'alkuperäistä' (30 ja 50 luvulla leimatut) omistavana täytyy sanoo että tän terät on tosiaan helppo avata. Terä pitää teränsä ihan ok. Ja veitti on tukevan tuntunen. kunhan muistaa että tukkimettälle kannattaa sit ostaa ihan oikee puukko. Eikä tää oo hinnalla pilattu. 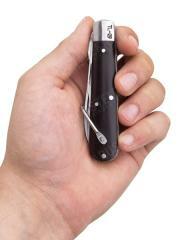 It's very small and light, cuts through most anything you would expect a small electrician's knife to cut. The only flaw is that when closing the normal non-locked blade it contacts the stop and dulls it on that spot over time. I personally just dislike carrying about a medium sized pocket knife. I either have dikes or aviation snips on hand so I really like these. I think that they were made out of carbon steel blades back in the time, which are easier to sharpen and held a better edge. This interpretation delivers what it promises, but don't get too happy go lucky using the flat pointed edge as a screwdriver, the tip is quite thin and it will bend under stress. It's an interesting choice if you want a knife and don't want to carry an 1337_Oprtor xXinthemiddleofthenightXx blade that makes people freak out every time you open it while asking "Is that legal?". 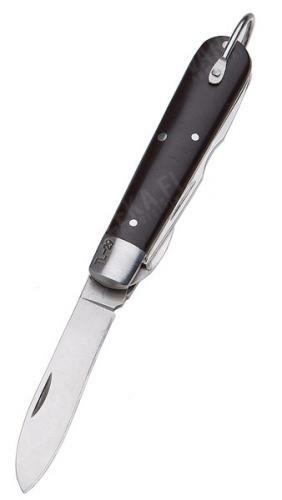 Nah, this is a grandpa knife that evokes a sense of calmness and security around you.